I have now passed the 5 week mark of using the lash serum. You can see my first post about it here. 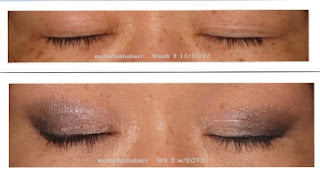 In all of the EOTD pictures, I am not using any mascara. During week 5, I was pretty sick so I didn't use it consistently. I would guesstimate that I probably applied it only half the time. I'm not sure if it's because of the darker EOTD but it does look like my lashes are significantly fuller than previous weeks. One thing that I have noticed is that I now have lower lashes! It was quite sparse to say the least. The one thing that I can't seem to do is take pictures of it. Perhaps if I apply mascara first and take a picture that will work. I will try that later. I usually don't like to use mascara on my lower lash line because I don't have much lashes to begin with. 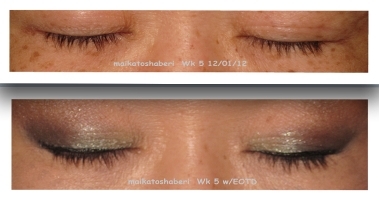 I also find that when I do use mascara on my lower lash line, I don't like the effect. 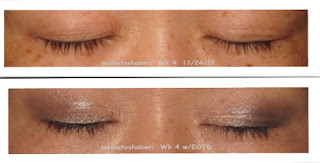 I think that I am still seeing some improvement in my lashes. I've been quite impressed by this lash serum. I will do an update in another couple of weeks or so. @Rainy Days and Lattes--I'm very much impressed and happy by this serum. It's proof to me that I don't need to spend over $100.00 on a lash treatment (as I did with Trish McEvoy). This drugstore brand under $15.00 is working out just as well. I'll probably use it for about 10 weeks and then will give it a rest for a while. I'll go back to using it again after my rest period.